Journey aboard the Indian Pacific cruise along the scenic Murray River, stroll through vineyards in the iconic Barossa Valley. Exclusive to Holidays of Australia & the World. 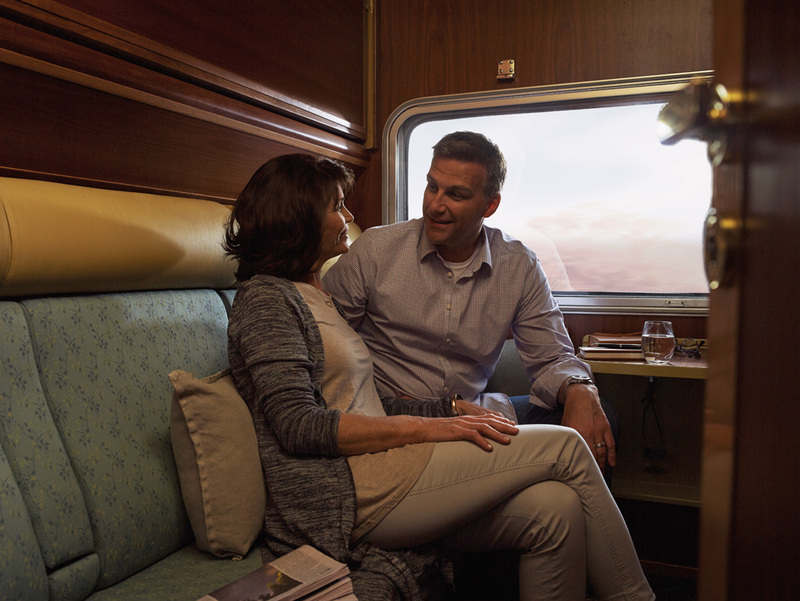 Indulge in the all inclusive service on board the Indian Pacific. Watch for kangaroos, hair-nosed wombats, and Murray long necked tortoises as you begin your cruise. Cruise past incredible river gorges and soaring 90 metre cliffs. Experience the maze of the river system on a discovery vessel. 1 night aboard the Indian Pacific travelling from Sydney to Adelaide in Gold or Platinum Service. 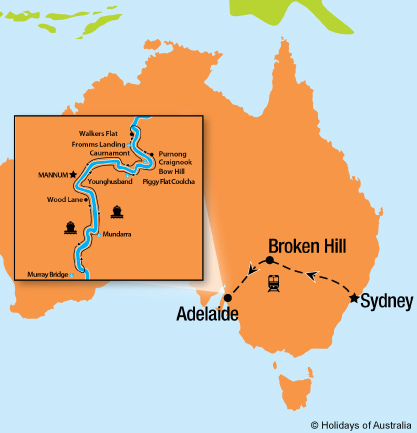 Your journey includes meals, drinks and an off train excursion in Broken Hill. Transfer from the Rail Terminal to your hotel. 1 night stay in Adelaide at Hilton Adelaide including breakfast. Morning Adelaide City Sights tour. 3 night Murray Princess Discovery Cruise including all on board meals, transfers and a Barossa Valley tour. Murray Princess conditions: Pricing based on Early Bird fares. Early bird fares must be booking 6 months prior to departure date, for bookings outside these fares there is a supplement of $139 per person twin share or $189 single share. Additional Advance Purchase conditions: Must be booked at least 6 months prior to departure date and is subject to limited availability per departure. 100% non refundable deposit due at time of booking. Additional Saver fare conditions: Subject to limited availability per departure. Season dates are correct at time of publication and are subject to change without notice. Through the big screen window of your cosy, well-appointed cabin, you’ll watch tremendous secrets unfold as the train transports you from one end of the continent to the other. Gold Twin, a comfortable sleeper cabin featuring private en suite and upper and lower berths that convert to a three-seater lounge by day. Make fast friends in the Outback Explorer Lounge and enjoy a complimentary drink from the all inclusive bar. Gold Single, a compact sleeper cabin featuring a bed that converts to a seat by day and shared shower/toilet facilities located at the end of the carriage. Platinum Service promises and delivers a journey beyond expectations. The Platinum cabin boasts almost twice the size of a Gold Twin Cabin. By day your cabin is configured as a private lounge with deluxe lounge seating, a table and two ottomans. By night you’ll sleep easy as the lounges convert to a comfortable bedroom with either a double bed or twin beds. Interested in booking Platinum Service? Call our team on 1300 854 897 to check the availability on this departure.